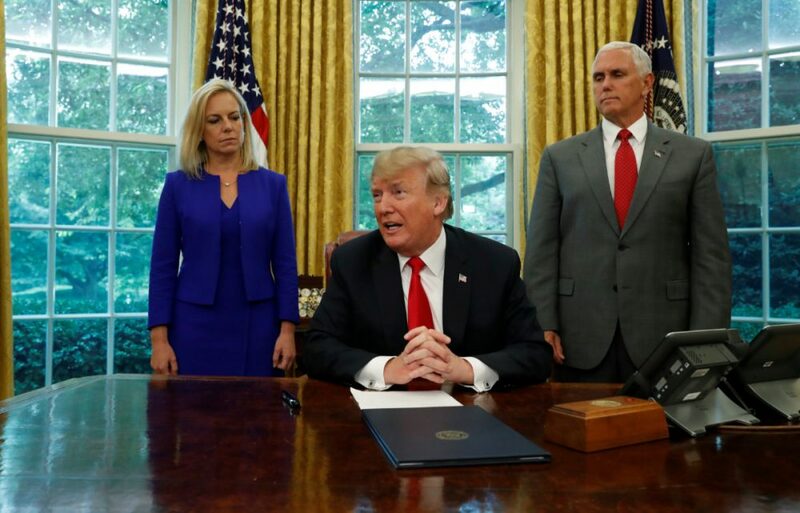 President Donald Trump sits at this desk in the Oval Office with DHS Secretary Kristin Nielsen and Vice President Mike Pence prior to signing an executive order on immigration policy at the White House in Washington, U.S., June 20, 2018. House Republican leaders abruptly postponed voting on a compromise immigration measure amid ongoing infighting between conservative and moderates. Majority Leader Kevin McCarthy’s office confirmed the decision. Voting that had been expected Thursday now would be held Friday instead. That’s according to aides who demanded anonymity because they were not authorized to discuss the situation publicly. House Republicans have been struggling on rival immigration bills. A more conservative measure was rejected Thursday. The compromise was negotiated between GOP conservative and moderate factions. The Republican-run House has rejected a conservative immigration bill that offered no path to citizenship for young “Dreamer” immigrants. It also would have made it harder for immigrant citizens to bring relatives to the U.S. and taken steps to crack down on illegal immigration. The measure’s defeat was long expected. Many GOP moderates considered it too harsh and Democrats were solidly against it. Thursday’s vote gave hard-right Republicans, who largely come from deep-red districts, a chance to broadcast to voters the tough steps they would take on the issue. The measure was defeated 231-193. The House next plans to debate a GOP-measure crafted by Republican leaders as a compromise between party moderates and conservatives. That bill also seems likely to be defeated because some conservatives consider it too lenient. President Donald Trump said he’s “officially” inviting Democratic leaders to the White House to discuss immigration legislation. Speaking ahead of a Cabinet meeting, Trump said he was making the open invitation through the press. Trump is blaming Democrats for obstructing immigration legislation, saying, “We need two to tango.” A Republican-led effort in the House to address legal status for young immigrants brought to the U.S. illegally and to fund Trump’s border wall is teetering on the edge of collapse. It wasn’t immediately clear whether Democrats had been formally invited or if they were planning to accept. President Donald Trump is defending his Wednesday executive order to end new family separations at the border, but said Congress needs to act to permanently fix the problem. As congressional Republicans look to pass sweeping immigration bills Thursday, Trump said Democrats are obstructionists and is accusing them of not caring about the children separated from their parents. This spring, the Trump administration put in a place a zero-tolerance policy on illegal border crossings, resulting in children separated from families at the border. 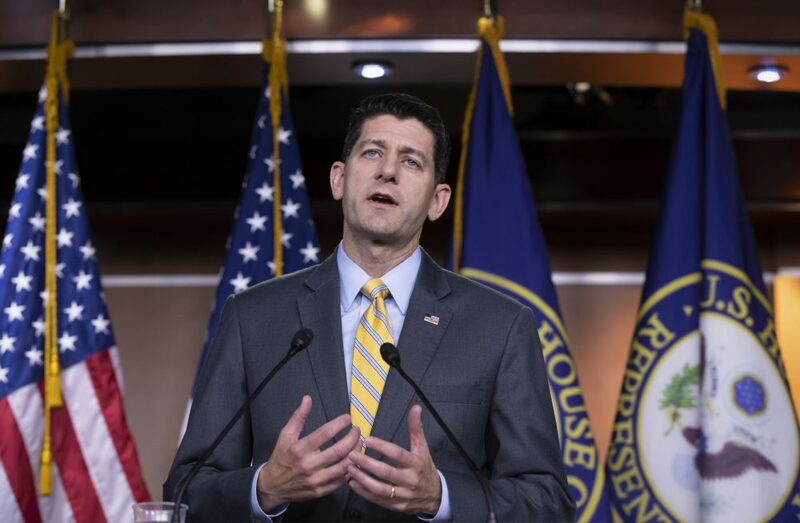 House Speaker Paul Ryan said he was “pleased” President Donald Trump ordered an end to separating children from parents at the U.S. border. But Ryan stopped short of predicting the House will pass legislation Thursday aimed at resolving broader immigration issues ahead of the November elections. Trump tweeted earlier that any such legislation is all but doomed in the narrowly-divided Senate. There’s an embarrassing, $100 billion oops in a House immigration bill. The Republican-written measure was supposed to give initial approval for $24.8 billion spread over the next five years for President Donald Trump’s proposed border wall with Mexico and other security measures. Instead, the legislation says it would provide $24.8 billion “for each” of the next five years. Republicans call it a drafting mistake. The text will be corrected in a procedural vote the House expects to take Thursday. 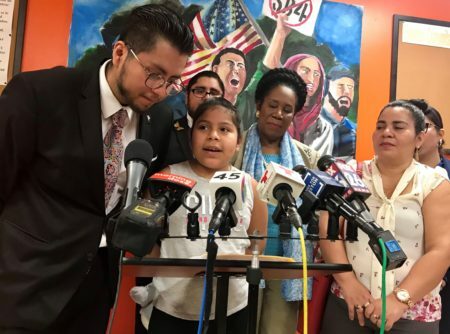 The error is in a bill that offers no pathway to citizenship for many young migrants who came to the U.S. illegally as children and has stringent restrictions on legal immigration. The measure seems certain to be defeated. The House also plans to vote on a more moderate GOP immigration bill. Pelosi said the legislation makes House Republicans “complicit” in President Donald Trump’s “zero tolerance” policy that has resulted in more than 2,000 children being separated from their parents at the border. She spoke as the House raced toward votes on two broad immigration bills that would, among other things, allow immigrant families detained after crossing the border to be held together. Trump suggested Thursday that any measure the chamber passes would be doomed in the Senate anyway. One bill is aimed at appealing to GOP moderates, while the other is harder-line legislation favored by conservatives. A civil rights group attorney says federal prosecutors unexpectedly dropped misdemeanor charges against 17 adult immigrants who crossed the border with children. 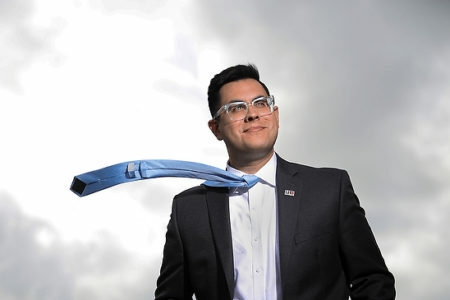 Efren Olivares is a lawyer with the Texas Civil Rights Project. 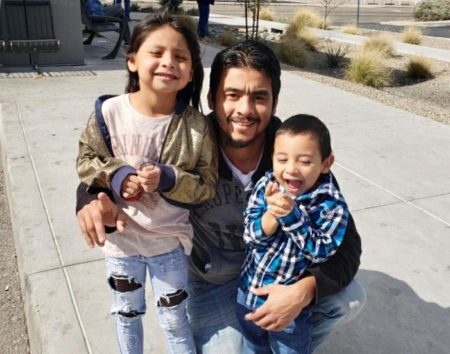 Speaking outside of the federal courthouse in McAllen, Texas, he said the 17 immigrants were supposed to have been sentenced Thursday morning for improperly entering the U.S. The Pentagon says it is providing 21 lawyers to the Justice Department to help prosecute illegal immigration cases on the U.S.-Mexico border. A spokesman, Lt. Col. Jamie Davis, said Thursday that the lawyers have criminal trial experience and will be appointed as full-time special assistant United States attorneys. He said the attorneys will help prosecute border immigration cases with a focus on misdemeanor improper entry and felony illegal entry cases. Davis said the temporary assignments are to last for 179 days. Davis said the Justice Department made the request in May, and Defense Secretary Jim Mattis approved it earlier this month. House and Senate Democrats are demanding that President Donald Trump reunify the families that were separated at the U.S. border. Democratic leaders Chuck Schumer in the Senate and Nancy Pelosi in the House sent a letter Thursday to the White House urging the president to do everything necessary to reunite more than 2,300 children with their families. Trump on Wednesday issued an executive order that allowed families to stay together, but the Democrats say that the Health and Human Services Department didn’t take immediate steps to reunify the families. Earlier Thursday, Trump took aim at the Democrats saying New York’s Schumer and California’s Pelosi are both weak on crime and border security. The House is set to vote Thursday on two immigration bills. House Republican leaders are still trying to build support for one negotiated among conservative and moderate factions of the GOP. Trump’s tweet comes as the House plans to vote on two immigration bills. House Republican leaders are still trying to build support for one negotiated among conservative and moderate factions of the GOP. The president has said previously that he wants to change the Senate’s rules to eliminate the filibuster, and allow passage of all bills on a simple-majority vote. 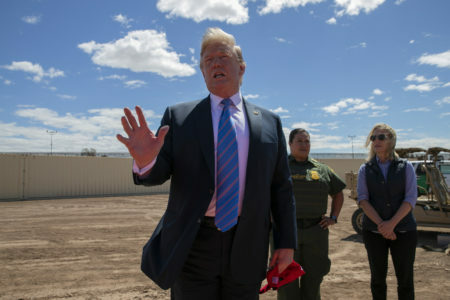 President Donald Trump says the U.S.-Mexico border is a “big mess,” and that at some point the Democratic leaders in the House and Senate “will be forced to do a real deal” on immigration. Trump’s tweet Thursday comes as the House plans to vote on two immigration bills. House Republican leaders are still trying to build support for one negotiated among conservative and moderate factions of the GOP, although the measure is unlikely to pick up much, if any, Democratic support. Trump had embraced a hardline “zero-tolerance policy” at the border, only to back down after reports that the approach resulted in 2,300 children detained separately from their families. Tweeting on Thursday, Trump said Senate Democratic leader Chuck Schumer and House Democratic leader Nancy Pelosi are both weak on crime and border security. House Republicans are trying to approve an immigration overhaul that teetered ahead of voting Thursday. Lawmakers are struggling to move past a debate that has become politically fraught amid the dire images of families being separated at the border. President Donald Trump’s sudden executive action Wednesday on the border crisis stemmed some of the urgency for Congress to act. But House GOP leaders still were pulling out the stops to bring reluctant Republicans on board to resolve broader immigration issues ahead of the November midterm elections. Passage was always a long shot. But now failure may come at a steeper price as Republicans — and Trump — raise expectations that the party in control of Congress and the White House can fix the nation’s long-standing immigration problems.